WALKER, Bettie Elaine., age 61, of Hendersonville. May 21, 2006. She went to be with the Lord along with her husband Billy Walker. She is survived by her daughter Kelly Brooks, grandson Joshua Brooks, sister Jo Hankins C.J., brothers Jesse Crook Laura and Lewis Crook, several nieces and nephews and great nieces and nephews. Visitation will be from 2pm til 4pm and 6pm til 8pm, Wednesday, May 24, and Thursday, May 25, at Hendersonville Funeral Home. Funeral service will be 2:30pm, Friday, May 26, at Cornerstone Church in Madison, TN with Pastor Maury Davis officiating. Pallbearers: Ed Gregory, Peter Leggett, Bob Butler, Bob Dorsey, Keith Walker and Jim Maxwell. Graveside services will be private. In lieu of flowers the family request that memorial donations be made in the name of Joshua Brooks to the Bank of America, West Main Branch in Hendersonville for his medical expenses. We send our condolences to the family of Bettie. We are glad we got to meet Bettie, and always enjoyed the e-mails we received from her. I didn’t know Billy and Betty personally but anytime I would e-mail Betty she was always faithful to e-mail me back. She was so much a part of the country music world with her tireless efforts to keep the older stars in the forefront. There are no words to say how much these two wonderful people will be missed. We will always love you Billy and Bettie. I never had the pleasure of meeting Bettie in person but I have talked with her several times on the phone in March and April, she was a great lady. I still have 3 emails that I have from her that I have saved in my files. she was a very helpful person. I will miss talking to her on the phone. To her family I pray that God will be with all of you and richly bless all of you. I’d like to say that Billy Walker and Bettie Walker will be surely missed. Billy a huge country music and Grand Ole Opry legend brought many memorable music moments to all us fans. Bettie Elaine Walker I hear was a huge contributor to Country Musics Golden Voice Awards which remember our legends. I know the Lord is welcoming Billy & Bettie into his arms and his home in the sky. You all have our deepest sympathy and in our thoughts and prayers. Mrs. Walker knew the Lord, and we can have comfort that she and her husband are in the presence of Jesus now and forever. She and her husband will be missed for now, but we will join them one day. As a songwriter, I know that there are words that can be expressed through music in this time of grief, but let us just remember that they loved each other and God. Peace be unto you. May GOD BLESS BETTIE WALKER’S FAMILY AND FRIENDS DURING THIS TIME OF SORROW IN THIER LIVES. TO BETTIE, THANKS FOR YOUR HARD WORK IN KEEPING OUR TRUE TRADITIONAL COUNTRY MUSIC ALIVE. May GOD BLESS YOU AND May YOU REST IN PEACE. I got to meet Bettie I think back in 1998 in York,PA along with Billy. He was singing on the small stage at the York Fair. I bought a tape and I remember she was such a nice person!! She along with Billy will be missed very much. I am sure they will get their just reward in Heaven. We have to wonder why things happen in life but I guess the Lord had plans for them. My thoughts and prayers are with the family at this very sad time. I want to extend the sympathy of our family for the loss of your mother, Bettie. She was a wonderful lady. She will long be remembered by her many friends and family. Bettie and Billy talked about you and Joshua all the time. They were extrememely proud of Joshua. We will all keep you, Joshua, and your family in our thoughts and prayers. Marge Tracy; John, Vicki & Shane Tracy;Glenn, Rachel, Alicia, Julie & Kim; George, Sue, Josh & Jay; Deb,Tom, John T & Julie Ingle; Mary & Leo Milner. Bettie was a true friend and a beautiful Lady. I knew her through my association with her husband, Billy. Her presence will be missed by all who had the honor to call her FRIEND. 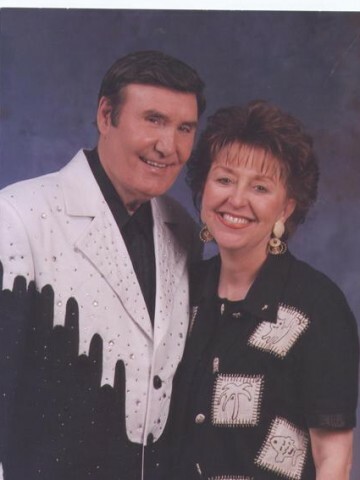 We are very sorry to hear of the departing of the Country Legend and his wife Bettie. May God comfort their family.